The vibrant city of Birmingham is perhaps all too often overlooked as a destination but ignoring Britain’s second city would be a mistake. Brimming with culture, and featuring more miles of canal than Venice, Birmingham is a heady mix of the old and new waiting to be discovered. To seal the deal, as a major transport hub getting to Birmingham is a breeze – you can catch a London to Birmingham train and find yourself in the city centre in under 90 minutes. The Bullring area of Birmingham first held a market in the 1100s, and commerce is still thriving today, with two large shopping centres in the area. If that was not enough, a third shopping centre opened at nearby Grand Central in 2015, with a covered shop-lined walkway linking the two. In total, the area hosts over 200 shops including all the biggest brands, and unsurprisingly it is one of the most visited shopping districts in the UK. 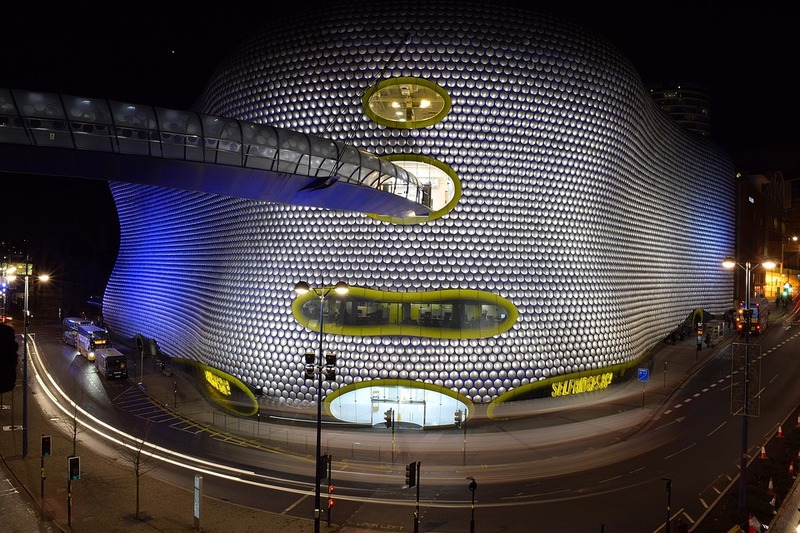 It is not just about the quantity, however, with the Bullring hosting retailers you will struggle to find elsewhere, including one of only four Selfridges. If all those possibilities make you peckish, you will find an abundance of restaurants in and around the Bullring where you can grab a bite to eat. If you love music, don’t miss the chance to see a concert at Symphony Hall. Opened in 1991, it is widely considered the best concert hall in the country, and one of the best in the world. The design is inspired by classic European concert halls whilst employing the latest technological innovations, combining incredible architecture with the best possible acoustic experience. Its capabilities were extended further in 2001, with the installation of an organ with six-thousand pipes – the largest of its type in the UK. The City of Birmingham Symphony Orchestra is in residence and performs regularly, ensuring the standard of classical performances are very high, but the hall also plays host to a wide variety of music, with acoustic canopies and panels being altered to suit each sound. There are regular jazz, rock, country and pop gigs, ensuring that whatever your tastes there will be something for you. On occasion, the organ is even used to accompany silent movies, or an orchestra provides a live score as you watch a classic blockbuster, providing an unrivalled cinematic experience. As the name suggests, jewellery is the major feature here – in fact, 40% of British jewellery is made within this square-kilometre in the north-west of Birmingham. Here you can browse dozens of independent craft shops, each with a wide selection on offer, or you can even commission bespoke designs. It is the perfect place to find a unique gift no matter your budget, with prices much lower than on the High Street. Once the sun has set and the shops have shut, there are still plenty of reasons to stay in the Quarter. For food, a broad mix of independent restaurants can be found spread around the area, and if you are looking for drinks and a good atmosphere, then St Paul’s Square is surrounded by bars and pubs nestled amongst historic buildings. Getting to the Jewellery Quarter is easy. It has its own train and tram station and is only a ten-minute walk from Birmingham Snow Hill station. Birmingham has a rich history, from the Domesday Book to its industrial boom and there are countless ways you can explore it throughout the city. The National Trust’s “Back to Backs” tours offer an interesting glimpse into Birmingham’s social history. Led by knowledgeable guides, you travel through the cramped properties. These have been carefully restored to how life would have been for the residents during various time periods, allowing you to travel in time from the 1840s to the 1970s. A visit to the older Blakesley Hall allows you to experience the life of a middle-class merchant family during the 1600s. Situated in the suburbs and surrounded by modern buildings, it is a remarkably well-preserved insight to the Tudor world, with actors helping bring it to life. In contrast, a rather more grand house of the period can be found at Aston Hall. Its turbulent history is perhaps best highlighted by the cannonball-shaped hole in the staircase, created during a civil war siege. For a look into Birmingham’s industrial heritage, there is also a wide range of excellent museums offering a surprising view into different industries. They include The Coffin Works – where they didn’t actually make coffins and The Pen Museum – where they did make pens. Finally, if you are already heading to the area, then you should definitely make time to visit the Museum of the Jewellery Quarter – voted the ‘best small attraction’ in the UK. For those with a sweet tooth and in search of a family-friendly day out, then Cadbury World ticks all the (chocolate) boxes. It is located to the south of Birmingham in Bournville, the model village originally built by Cadbury around their chocolate factory. On the tour, you learn about why the Cadbury brothers decided to move out of the city centre, and highlights include the chance to discover the Aztec origins of chocolate in Central America, a 4D cinema experience and a ride through a chocolate wonderland. And, of course, there is plenty of the world-famous chocolate to sample.